In the 1990's, QSI installed their custom Live Action animal sound units into Frank's Roundhouse produced rolling stock. A sensor inside the car increases or decreases the animal sounds based on the train ride. The faster and jerkier the ride, the more frantic the animal sounds become. QSI also sold cars without sounds. Chicago Burlington & Quincy 49071 Burlington Route stock car. This car has a Dual-Animal set of Elephant and Lion sounds. Also made with road numbers 49072 and 49073. Southern Pacific Daylight Express stock car. No sounds were installed inside this car. Santa Fe Horse Express 43356 stock car with horse sounds. Also made with road numbers 43357 and 43359. Armour Stock Express 48532 stock car with dual cattle and horse sounds. Also made with road numbers 48531 and 48534. Canadian National 49087 Serves All Canada stock car with cattle sounds. Also made with road numbers 49086 and 49088. Chicago and Northwestern 49082 stock car. No sounds were installed inside this car. Also made with road numbers 49081, 49083 and 49084. Photo courtesy of the H. Schmid collection. Reading Lines 104666 stock car with cattle sounds. Photo courtesy of the T. Wardle collection. 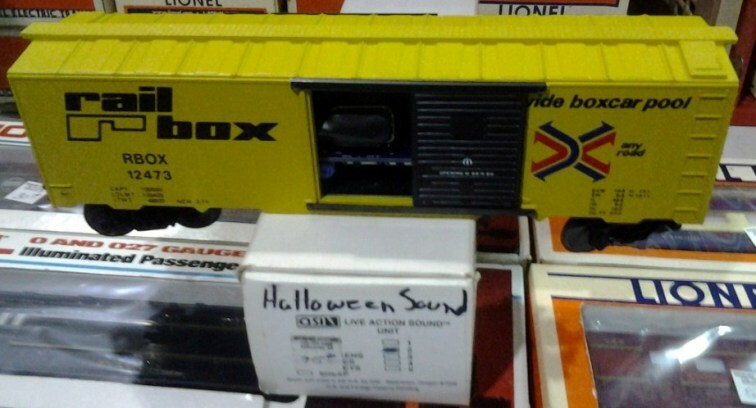 Frank's Roundhouse # 45 Railbox boxcar with Halloween sounds. Circus stock car with calliope sounds. Merry Christmas stock car with Christmas sounds. B.O.&O. R.R. 1031 Halloween stock car. This car has "haunted" sounds. Photo courtesy of the T. Wagner collection. View inside the Halloween QSI stock car. The pendulum motion sensor is mounted on top of the sound board. Power comes from a standard 9-volt battery (not pictured). Photo courtesy of the T. Wagner collection.